Aunsoft Final Mate is the recommended best 1080/60p MTS Merger, which supports merging/joining 2 or 3, 4 or multiple native 1080 60p/50p MTS files into only one 60p/50p MTS file without conversion and losing any quality. If you owns camcorder like Panasonic HDC-SDT750, which creating native 1080 60p/50p MTS files, if you want to merge/join these 1080 60p/50p MTS files into only one 60p/50p MTS file and keep its native HD quality, you can use Aunsoft Final Mate to merge/join HDC-SDT750 60p/50p MTS files into one raw MTS file with no loss of quality. Now I will show you a fast way to merge raw Panasonic HDC-SDT750 1080 60p/50p MTS recodings into one file without conversion. Step 1. 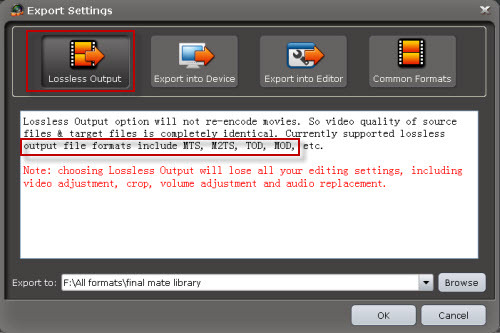 Capture native 60p/50p MTS files from HDC-SDT750 camcorder to Aunsoft Final Mate. Step 3. Merge/join multiple Panasonic HDC-SDT750 1080 60p/50p MTS files without conversion. Click the Export button and then choose Lossless Output and click the OK button, the MTS/MTS Joiner will start merging large SDT750.MTS files into one MTS file without conversion at the fast speed. The non-conversion process will prevent loss of quality when merging Panasonic SDT750 AVCHD MTS files. 1. 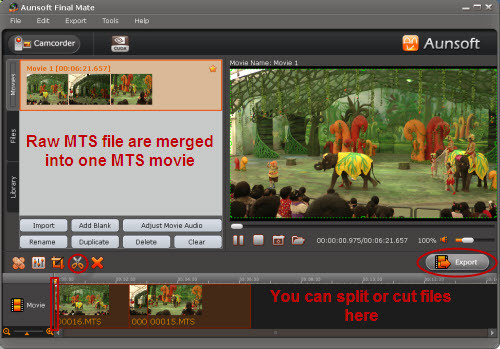 If you think that HDC-SDT7501080 60p/50p MTS file is too high in quality that can’t import to editors, media players or portable devices, you can also use this program to convert 60p/50p MTS file to MP4, AVI, MOV, WMV, etc for editing or playing. 2. Aunsoft Final Mate also supports Panasonic HDC-TM700, Panasonic HDC-HS700, Panasonic HDC-SD700, Panasonic HDC-SD600 which also record 1080 60p/50p MTS videos.